We always have plenty of bananas in our house and sometimes there’s a need to rescue them from the depths of going brown and overripe! Besides the usual banana bread recipe we love, these yummy Coconut and Banana popsicles are a great snack or party food idea. This healthy popsicle recipe suits all tastes, is gluten and sugar-free and these are also vegan popsicles. What a delicious combination – banana flavoured popsicles with coconut milk! Place the mashed banana into the popsicle moulds, fill it up to the halfway mark, freeze for an hour or until set. Fill the remaining moulds with the coconut milk and sprinkle with shredded coconut. Freeze overnight. To remove the popsicles from the moulds, run under hot water for 10 seconds. Option: This recipe is 100% sugar-free, however, if you prefer something slightly sweeter, mix the banana and coconut milk together with 2 tbsp of honey and top with shredded coconut and freeze. ** Avanti Star Ice Block Moulds can be purchased >> here. 5 Banana Facts that will have you and your family eating loads of Coconut Milk and Banana Popsicles! Bananas are an excellent source of the carbohydrates in the form of natural sugars and starch. Normal growth needs protein to help produce new cells. A small banana smoothie (150 mL milk and a half banana) as a snack or meal is an excellent source of both protein and calcium. This vitamin is needed for making red blood cells, and carrying nerve impulses. The B vitamin folate is needed for proper growth and development in toddlers and is hugely beneficial for pregnant women. Half a banana will give a toddler about 15 percent of their folate needs each day. Bananas are a great-tasting source of fibre, so even a small serving a day, especially for a young child, will help keep you regular. 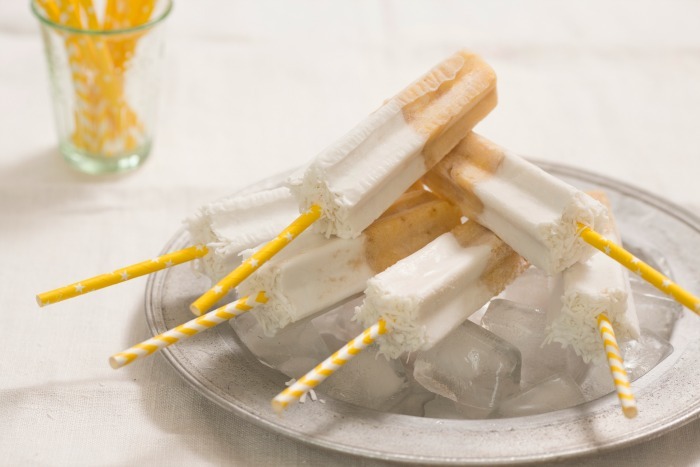 The best thing about these coconut and banana popsicles is that if you feel like something a little different, you can easily adapt the banana popsicle recipe to include things like berries or even choc buds. If you prefer your fruit nice and smooth, check out my Breville Boss To Go Review, it’s the perfect blender for purees and smoothies! Love bananas? Check out these banana jaffle recipes or this flourless white chocolate slice with orange blossom and banana! Can I have one for breakfast?! Yummo! Oh, I’m bookmarking this, I’m always after new ideas for icy poles, we go through so many! YUM! We are really into making ice blocks at the moment, these sound delish! And dairy free, woo hoo! Well here’s some to add to your list! These look great, perfect for the hot weather! What a great idea!!! We have a party coming up and I’m looking for inspiration so thank you! They are, aren’t they? So glad it gave you some inspiration! I’m not a big fan of coconut myself but miss almost 3 would be a fan! She loves ice blocks… So healthy is better! It definitely is an acquired taste, especially the coconut milk. I’m sure your 3 year old would love it though! Easy AND gluten free? I’m definitely going to have a go at these Eva – yummo!